In this blog post, one of our participating architects, Aisling Shannon Rusk, outlines some of the surprising things that clients explore when they go for a consultation. Above: Interior view of house renovation by Aisling Shannon Rusk. Photo by Bradley Quinn. I am a female sole practitioner in Ballyhackamore who juggles being an architect with parenting two very young children and writing up a PhD. I offered a handful of sessions for the 2017 edition of ask an architect which, to my surprise and delight, were all taken up. For me, this was an easy way to donate my time towards an excellent cause, because meeting people, seeing their spaces and hearing about their spatial problems and ideas is possibly the part of being an architect I enjoy the most. 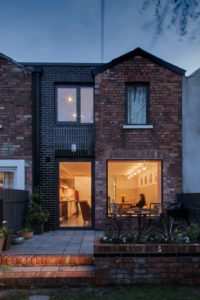 Exterior view of house renovation by Aisling Shannon Rusk. Photo by Chris Martin. Interestingly, I found I spent much time talking people out of building extensions they didn’t need, or finding creative ways to avoid expensive alterations like replacing flights of stairs. There was the couple, for example, who were considering building a covered link between their back door and a mouse-ridden outdoor utility room, and whose problem was simply and inexpensively solved by my suggestion to move the washing machine and dryer into the large cupboard in their generous back hall. Sometimes it just takes a new pair of eyes to look at a problem differently. I think this is something architects, being creative problem-solvers, are typically very good at. So if you are at all unsure about booking a session, don’t be. This is a unique opportunity to make use of an hour of your chosen architect’s time, for which you might usually pay substantially more than the suggested £40 minimum donation, to discuss any problem, big or small, domestic or commercial, or altogether other. And support a great local charity at the same time. I also had the honour in September of attending a talk by Dr Suneil Jain and a tour of the research labs at the Centre for Cancer Research and Cell Biology, which has benefitted from ask an architect’s donations to Friends of the Cancer Centre over the last two years. There, I saw for myself the remarkable work they are doing and the impact that donations like yours can make, both on pioneering research, trials and treatments and also, importantly, offering vital support to those currently undergoing the hell of cancer treatment, and their loved ones going through it all by their sides. This is a worthy cause making a big difference not only locally but also globally, through world-leading cancer research. Aisling Rusk practices as an architect at Studio Idir. Find out more about her work and research on her blog. You can book a consultation with Studio Idir during ask an architect 2018 – bookings open now.